I just started taking dance classes a few years ago – as an adult! There were moments where I was unsure of what I was doing, but I was told in class last week to keep this in mind: most people are just watching themselves! My friends taking the class with me (Victoria and Cornelia) also agreed that we’re only paying attention to our reflections in the studio mirrors, otherwise we would get distracted. Well, there’s a reason why they say to dance like no one is watching – so you’re not scared to go all out! 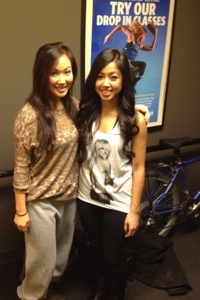 I saw a groupon for a dance studio in Yaletown: Exhale Studio. Not only did they have several types of dance classes, they also had a variety of yoga and pilates classes. The studio offered a one month unlimited pass to try any of their classes for $72 and the groupon was half of that – such a good deal! You only have to go to a few classes to get your money’s worth. And of course, I love taking full advantage of unlimited monthly deals so I tried just about everything there from bellyfit, zumba, burlesque, hip hop and even dancehall, which I hadn’t even heard of until then! All of the dance classes started with a brief warm-up and stretch. Then, the instructors would go through a short routine: trying to break down certain moves and then repeating them in sequence. I noticed a variety of skill levels from absolute beginner to some more experienced dancers. 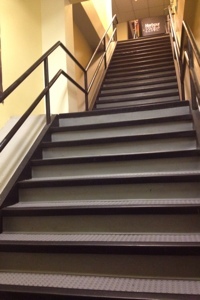 I enjoyed the variety of classes at Exhale but I wanted to learn more. I would leave certain classes wishing there was more time spent on specific moves. That’s when I started to look at Harbour Dance Centre. Now this is a serious studio! Everything from intro level classes to advanced classes for people who have been trained in classical ballet since they were four. 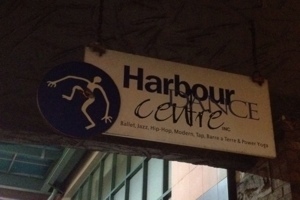 Harbour Dance offered drop-in classes; similar to drop-in classes at Exhale. (Right now they have a deal – $30 for 3 drop-in classes!) But they also offered Progressive Classes that would run for several weeks. I really liked the idea of fine-tuning some skills, building on what you’ve learned and practicing each week. I decided to sign up for a 7 week Progressive Broadway Burlesque classes with Leigh Torlage . For all my classes at Exhale, I pretty much wore the same thing: sweatpants or lululemon pants with and a tank top/t-shirt. After reaching the top, I arrive into this big spacious studio and notice – wow, all these women look like they are part of a Broadway performance! (Well, the class was called Broadway Burlesque and I would pick up more and more theatrical tips as the classes progressed!) Some were wearing stockings, glitter, high heels and feathers. Admittedly, I felt a bit out of place at first with my baggy sweatpants and sneakers! But, people were friendly and I joked with the one other person who was wearing workout pants that we’ll dress up next time. And yes, I did do some shopping for the next sessions (Urban Outfitters for their patterned tights and American Apparel for bodysuits) – hey, sometimes you gotta look the part to act the part! Our instructor Leigh had previously performed on Broadway and was in the movie, Chicago –she was funny, lively, warm and welcoming and acknowledged the different levels of dancers in the room. We would start the class with a warm-up (simple dance choreography, sit-ups, stretches..) and then break out into several lines and practiced different walks and movements while strutting across the floor. The last part of class was reserved for a dedicated routine. We would build on this routine each class and the earlier parts of class really complimented some of the later, more intricate choreography. Leigh also records the routine after every class and posts the video on a private Facebook Page. This is great so that you can watch what you did earlier and practice at home. Plus, t’s exclusive so no creepers allowed! Bonus at the end of the session? A live Student Performance Night at a local venue! More recently, I’ve been attending some Harbour Dance Centre drop-in classes with a couple of friends and we tried out the Pussycat Dolls Style Hip Hop with Jenny Duffy. She records the dances and you can view them on her YouTube Channel to get an idea of the classes. Next: Deciding how to use my last drop-in class! For more information about the dance classes I took at Harbour, including a private class as part of a ladies night out, check out these posts.